Klaserie Private Nature Reserve and the Southern African Wildlife College have a close working relationship. The SAWC’s Bathawk regularly flies rhino monitoring patrols for the Klaserie. To pay for this service, the Klaserie PNR donates to the SAWC, a buffalo hunt which this department then sells on for best advantage. 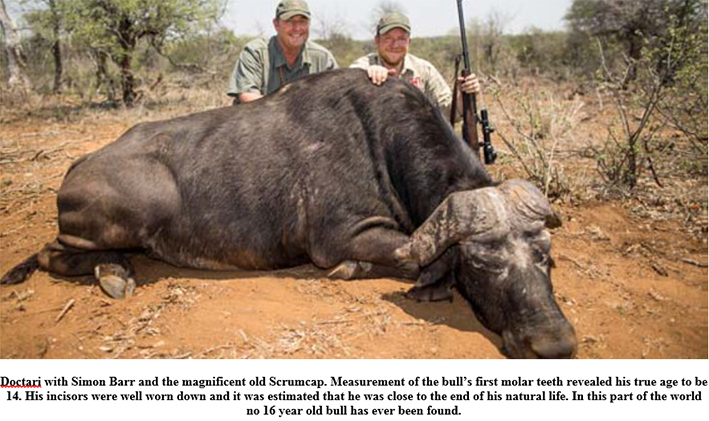 With this in mind and in keeping with the modern-day recommendation of hunting buffalo bulls only when they are past their breeding age, the hunt was offered as a challenge. Walk the Klaserie River to identify, age and trophy assess all bulls encountered (which was estimated to be 75 to 100) and then return to hunt the ‘oldest and ugliest’ one. To sweeten the challenge, a two night stay at the College was included, so as to be able to teach the participant all about buffalo, their ecology, aging, trophy assessment and hunting methods. And, to prepare him further for the experience, a crack at the department’s life-like and realistic ‘buffalo hunt’ targets were also included. Simon Bar of Tweed Media accepted the challenge. As Rigby’s (the prestigious British rifle maker’s) PR man, Simon intended to use the occasion to not only hunt his first buffalo but also to collect promotional material. As it turned out, he was able to achieve fantastic results on both accounts. The Lowveld was in the grips of an early October heat wave when Simon arrived in Hoedspruit, and it remained hot for the duration of his hunt. In true British fashion he endured the Hades-like conditions and a bad case of sunburn, in good spirits albeit with a perfectly stiff but very sweaty upper lip! Simon waxed the buffalo course, considering it an essential precursor for any inexperienced, first-time buffalo hunter. We transferred to the Klaserie early the next morning and over a three days period, 80 different buffalo bulls were encountered along a 20km stretch of the Klaserie River. Each one was aged and trophy evaluated. No. 69 was a wonderful old scrumcap – aged to be late in his 13th year and close to the end of his natural lifespan. He was definitely the oldest and ugliest bull encountered and the one we wanted. It took us another two days to find him. As is so often the case with old buffalo, they do not get to retirement age by being either stupid or dumb. Wiley and alert to the point of paranoia is what enables them to survive in lion country and this old guy was no exception. He proved to be a most challenging opponent. The hunt was a perfect example of how hunting pays for conservation. Thanks to the ever-weakening Rand, the 12,000 pounds Simon forked out for the experience equated to R241 000. This was enough to settle Klaserie’s account, keep Duke Safaris (the outfitters) and their staff occupied for a week and also enabled this department to benefit. Facts the anti-hunters seem to conveniently ignore, especially when hunting is done ethically and sustainably. Post Scriptum: Hunters’ dollars are often the driving force behind some of the most successful conservation initiatives. Dallas Safari Club for some years now has been a very generous supporter of the Southern African Wildlife College and the Sustainable Use and Field Guiding (SUG) Department in particular. Many of the students SAWC train are not in a financial position to pay for their studies. A recent very generous donation of $40,000 has thanks to the ever weakening Rand, given the Sustainable Use and Field Guiding (SUG) Department a needed financial ‘shot-in-the-arm’. This article was first published in The Buzzard – the Newsletter of the Sustainable Use and Field Guiding (SUG) Business Unit of the Southern African Wildlife College (SAWC) www.wildlifecollege.org.za. Reprinted with permission.